The BRIE lab is led by Brie Turner-McGrievy, PhD, MS, RD. The BRIE lab focuses on areas of research related to nutrition and obesity and chronic diseases. 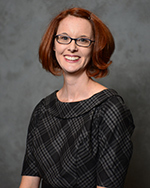 Brie Turner-McGrievy received her Master of Science degree in Nutrition and Registered Dietitian credentials from the University of Alabama in 2000. She went on to work in the area of clinical research for four years before pursuing her doctoral degree. Brie completed her doctoral degree in nutrition and postdoctoral fellowship at the University of North Carolina at Chapel Hill’s School of Public Health. Currently, she is an assistant professor at the University of South Carolina in the Department of Health Promotion, Education, and Behavior. Brie’s research focuses on behavioral interventions for weight loss and the prevention and treatment of chronic diseases. Brie has published research on the use of emerging technologies for weight loss and health promotion. In particular, her research has focused on the use of podcasting and social media to deliver behavioral weight loss interventions. Her research has combined this audio delivery method with other mobile enhancements including prompting and social support delivered via Twitter and use of diet monitoring apps for internet-capable mobile devices. Brie’s work has also focused on plant-based dietary approaches for chronic disease prevention and treatment among adults.